“The jewel of the South”, “a gem down here”, is what Scott James and Gretchen Quarterman agreed Lowndes County could be, starting with local government transparency and continuing with not waiting on Atlanta to build on local strengths such as South Georgia Medical Center and Wiregrass Tech. This entry was posted in Opportunity, PR, Stewardship, Transparency and tagged 92.1FM, Georgia, Kay Harris, LAKE, Lowndes Area Knowledge Exchange, Lowndes County, opportunity, PR, radio, Scott James, stewardship, transparency, Valdosta, VDT on May 4, 2014 by John S. Quarterman. Gretchen will be on Scott James’ drive-time radio show on 92.1 FM this Thursday, 7:30 AM May 1st. She’ll be talking about transparency, stewardship, and opportunity. You can listen over the air to WDDQ 92.1 FM or through various Internet sites, such as Streema. This entry was posted in PR and tagged 92.1, FM, Georgia, Gretchen Quarterman, Gretchen Quarterman for Lowndes County Commission, gretchenforlowndes, Hahira, Lowndes County, PR, radio, Scott James on April 29, 2014 by John S. Quarterman. 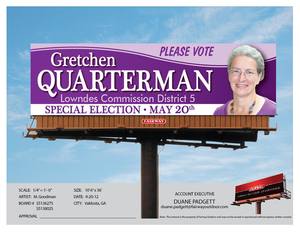 Gretchen Quarterman will be on Chris Beckham’s morning drive-time talk radio show 7:30 AM Tuesday April 29th, talking about why you should vote for her for Lowndes County Commissioner District 5. You can listen on the radio to WVGA FM 105.9 or online through various services such as Streema. Please tell your friends. You can also join this facebook event so people can see you’re going to listen. This entry was posted in PR and tagged 105.9, Chris Beckham, drive-time, Georgia, Gretchen Quarterman, Gretchen Quarterman for Lowndes County Commission, gretchenforlowndes, Hahira, Lowndes County, PR, radio, WVGA on April 28, 2014 by John S. Quarterman.